Two Chicago officers are in trouble for kneeling in a Colin Kaepernick protest style in an Instagram image posted by a local activist. The officers are facing a reprimand for violating department policy against political activity while on duty, the Chicago Tribune reports. 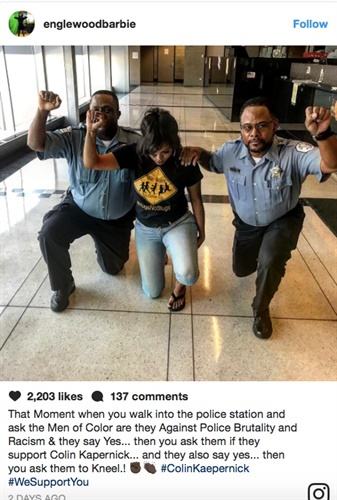 In an Instagram photo posted Sunday, the two officers are shown kneeling on either side of Aleta Clark, a Chicago activist who goes by the online name "englewoodbarbie." The post reads: "That Moment when you walk into the police station and ask the Men of Color are they Against Police Brutality and Racism & they say Yes... then you ask them if they support Colin Kapernick... and they also say yes... then you ask them to Kneel.!"